With the 2015 Oscars less than three weeks away, we here at the Collective blog have decided to review the eight films nominated in the Best Picture category. 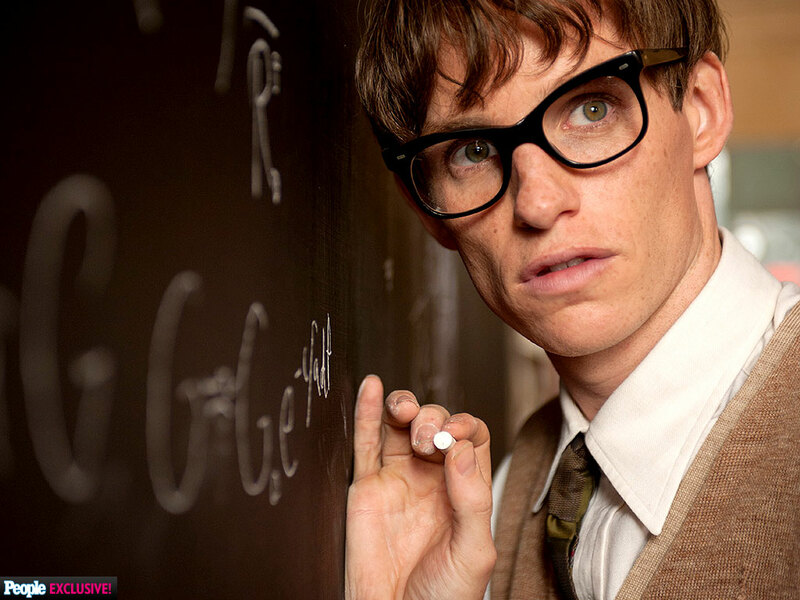 We (unknowingly) kicked this off with a review of The Imitation Game back in November, so it seems only fair to follow suit with its biggest competitor: The Theory of Everything (2014). 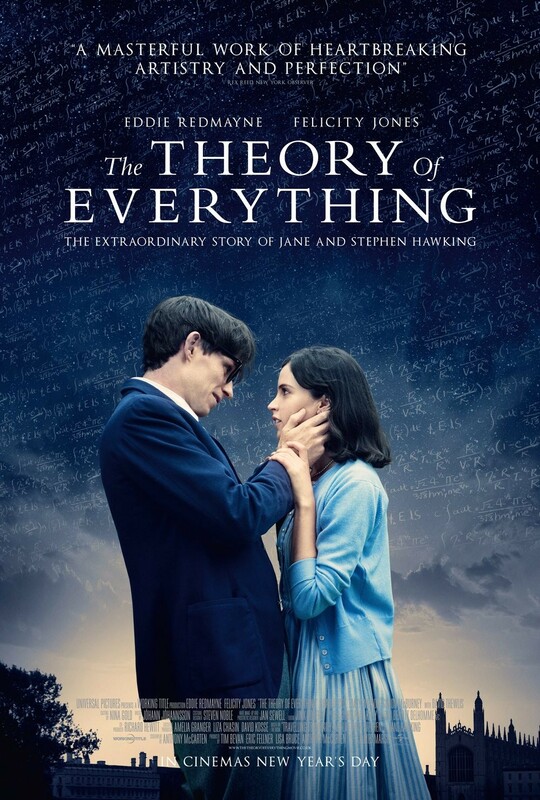 Based on the book Traveling to Infinity: My Life with Stephen by Jane Hawking, The Theory of Everything tells the story of renowned theoretical physicist Dr. Stephen Hawking (Eddie Redmayne) and his first wife (Felicity Jones). The film begins in 1963—about 21 years old, Stephen is a new Ph.D. candidate at Cambridge. He is energetic and spry, a student who is as active physically as he is mentally. We see him racing his bicycle to school, and later as part of the rowing team. It is almost painful to watch, knowing that soon all his bodily capabilities will be stolen from him. The scene is set against a beautiful score by Jóhann Jóhannsson. At a party, Stephen meets Jane Wilde. They immediately feel a spark despite their fundamental differences: as a physicist, Stephen doesn’t believe that God created the universe, whereas Jane is a devout Christian. The beginning of their relationship is a cruel parallel to the other changes in Stephen’s life. They are small at first; he knocks over a coffee cup, stumbles once or twice…things that can be seen as accidental. But soon he has trouble picking things up, and stumbles repeatedly. The worsening situation culminates when he loses control of his balance and collapses in the middle of campus. Diagnosed with ALS (or amyotrophic lateral sclerosis), a form of motor-neuron disease best known to the public as Lou Gehrig’s disease, Stephen is given a life expectancy of two years. Undiscouraged, Jane insists that she loves him, and that they will spend whatever time he has left together. Bolstered by her encouragement, he continues with his studies after they are married. He finally chooses his subject for his thesis: Time. As his family grows with the birth of three children, his physical condition worsens. He begins walking with one cane, then two, and then is eventually convinced to use a wheelchair. His power of speech is greatly diminished, the distorted words best understood by Jane who often “translates” for him. Despite the increasing setbacks, he is granted a Ph.D. for his theory on how time began. Meanwhile, Jane is beginning to feel the stresses of caring for her incapacitated husband, raising children, keeping house, and working on her own studies. Frustrated that Stephen refuses to see specialists regarding his condition, Jane decides to join the local church choir to give herself something to enjoy. Enter Jonathan Jones (Charlie Cox), a lonely widower and the choir director. Jonathan forms a close relationship with the Hawkings, helping Jane take care of Stephen. When Jonathan realizes that he has developed feelings for Jane, he distances himself from the family, unwilling to break up their marriage. While on a trip to France, Stephen falls ill with pneumonia and is in a coma. The cost of waking him to save his life results in a tracheotomy that means he can never speak again. This results in the usage of synthesized speech (something with which Dr. Hawking is now associated). During his recovery with the help of nurse Elaine Mason, he writes A Brief History of Time, launching him to world-wide fame. Unfortunately, his marriage has deteriorated as much as his body’s faculties, and he tells Jane that it is Elaine who will be going with him to America to accept an award. Though the breakup is amicable, it is heartbreaking for them both to realize that they cannot be both married and content at the same time. Not long after, Jane receives a letter from Stephen; he and his family have been invited to meet Queen Elizabeth. Reunited at the palace, Jane and Stephen watch their three children playing in the courtyard. “Look what we made,” he tells Jane joyfully. In the last poignant seconds of the film, their story rewinds to the moment he first sees Jane, mirroring Stephen’s longing to go back to the beginning of time to see how the universe was created. Its easy to understand why everyone is talking about Theory; why it has garnered five Oscar nominations and won so many other awards. Eddie Redmayne’s performance is remarkable—as Stephen’s story changed, so did Redmayne’s portrayal. There were moments when I almost forgot I was watching Redmayne, and not Hawking himself. It’s the type of movie that had me on the verge of tears nearly the entire time because of how raw the story is. The progression of his disease and his defiance in living through it is both inspirational and agonizing to see. It is, essentially, a first-hand account of a deadly disorder and the affect is has upon the patient’s life and the patient’s family, and that is what makes it a great movie. The film doesn’t glorify his accomplishments without first forcing you to understand the damages of losing one’s able-bodiedness. Stephen watches as his friends and family continue to walk and eat and talk without difficulty, while he is forced to require help in every aspect of his life. Jane watches as her husband deteriorates before her very eyes, and she is powerless to stop it. Theory is not without its setbacks, however. The film is slowly paced, and may not be everyone’s cup of tea. There is also the prevalent issue of disabled characters being portrayed by able-bodied actors in Hollywood. Although it made sense for Redmayne, an able-bodied actor, to be cast as Stephen since the film spans several areas of his life (from ability to disability), the movie does bring the topic to the forefront. As mentioned in this article by Scott Jordan Harris, there is very little work for actors who are not able-bodied. “When disabled characters are played by able-bodied actors, disabled actors are robbed of the chance to work in their field, and the disabled community is robbed of the right to self-representation onscreen.” What appeared to be an accurate depiction of disability to me could very easily be a sham to others, and that is concerning. This is an industry that can create a visually stunning and beautifully-scored film about the most inexhaustible, defiant disabled person in history—and yet this industry cannot seem to progress in terms of portraying the disabled, just as it often fails us in terms of race, or in terms of sexism. Let us hope that movies like this one can help bring growing awareness to the need for continuing change. Have any Oscar predictions? Let me know on Twitter @ImpalaMutineers. I will be going to see this as soon as possible. Probably Friday. It sounds incredible. I was trying to convince my mum to come with me. But…SHE DOESN’T KNOW WHO STEPHEN HAWKING IS!!!! Yep, this is real, folks. 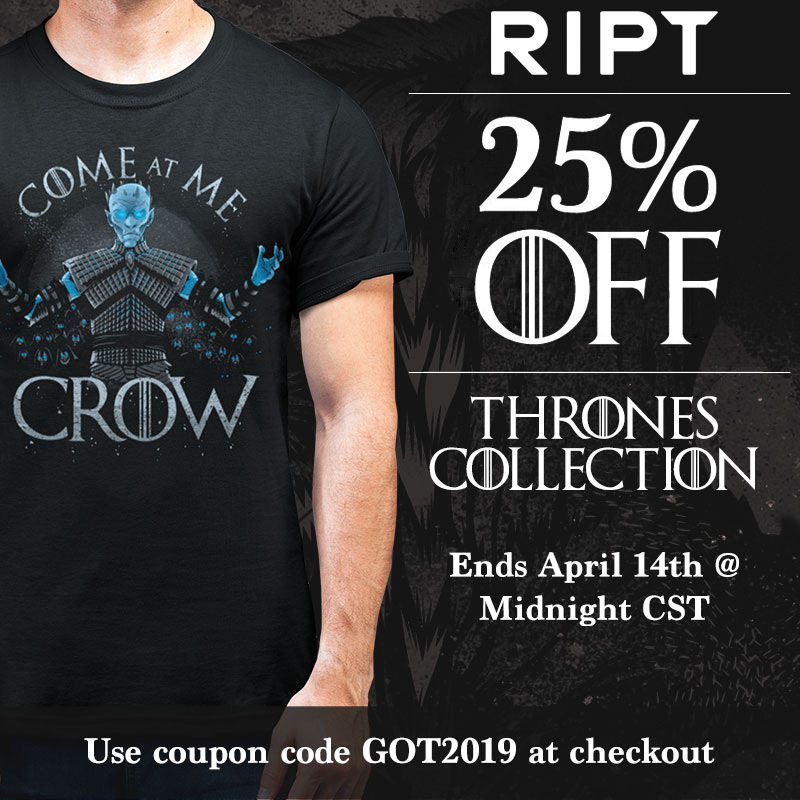 I think I might have to! Great review. I think Redmayne could take the Oscar for this but Felicity Jones was incredible too. I loved how the film so delicately explored marriage – I thought it was a much more comprehensive and well rounded film than Imitation Game overall.